This area, on a high bluff overlooking the Cedar River, was originally known as "Mullarky's Pasture," after its owner, E. 0. Mullarky. Nine acres of the pasture were sold to the Iowa Conference of the Evangelical Church in 1916 for $200 an acre. The Conference wanted the land for its annual camp meeting, previously held at Chautauqua Park in Waterloo. The first camp meeting was held here in 1917, after the completion of a tabernacle, administration building, dormitory, kitchen and dining hall. 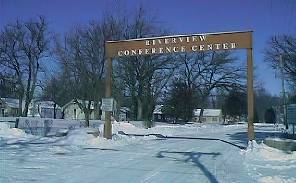 The site was named "Riverview Park" because of its beautiful location. The Park was later enlarged by, the purchase of 11 more acres at a price of $500 an acre. The Park was financed in part by the leasing of cabin lots for a period of 99 years. More than 85 cabins were eventually built on these lots. Since 1922, the Park has been the site of the annual one-week summer Cedar Falls Bible Conference. The Conference is an interdenominational symposium that has earned national recognition.